Bovis Homes will officially open Aspen Park to homebuyers early in 2012 with the completion of two large family showhomes that will showcase the quality of the new Apsley development. This marks a major milestone for the new 325-home community, which will provide excellent housing for the town and employment opportunities for local people and businesses for the next decade. 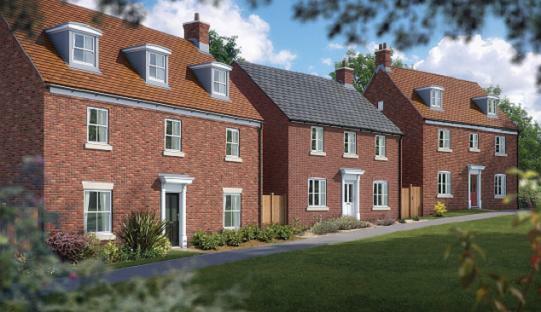 "With a mix of homes from two-bed apartments to six-bed detached family homes, Aspen Park will have something for everyone," said Regional Sales Director Alison Tindle. "We will be getting the ball rolling with two superb showhomes - a five-bed and a six-bed home - which will give local people a chance to see the high quality of property that will be on offer and we will be releasing the first plots for sale at the same time. "Aspen Park will integrate well with the existing community and we have stressed our commitment to the local area with a name that refers to the fact that the name 'Apsley' dates from the Anglo-Saxon period and means 'aspen wood'." The name is doubly appropriate, because as well as new homes there will be a wealth of landscaping and environmental management that will take place while the community takes shape. Bovis Homes will be creating a green corridor around the site - with works starting early in 2012 - with a new cycleway and more than 300 trees planted, along with 2,500m2 of shrub planting and 2,000m2 of wildflower planting. A new village green area with a sports pitch will be created in the south west of the site along with a formal public open space adjacent to an existing residential area. A fully equipped play area has already been temporarily located close to the local school, but as Aspen Park takes shape, two permanent play areas will be created in different parts of the new development. "We're not just about building homes, we're about building communities and the features of Aspen Park will not only be an attraction for new homebuyers, they will be of benefit to existing residents," said Alison. The highway improvements that Bovis Homes will be implementing from January next year include improved access into Aspen Park with a new T-junction and another improved T junction where London Road meets Featherbed Lane, where the company have already built Mulberry House, a selection of quality new apartments.